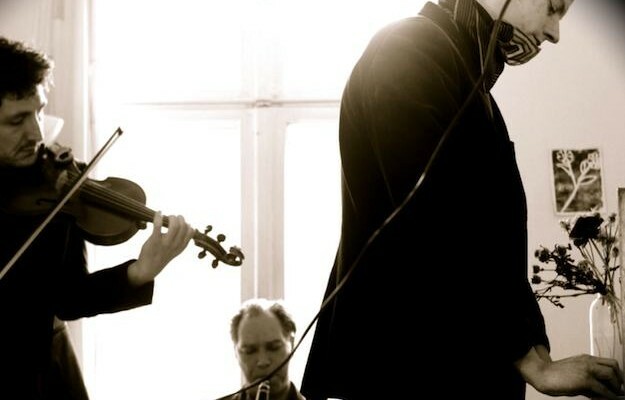 Formed in the late 90s in Berlin, Dictaphone was born by Brussels-bred multi-instrumentalist OLIVER DOERELL and clarinet / saxophone player KLAUS BRU. After Bru left the project 2000 , Doerell found a new partner in Berlins ROGER DÖRING , a man who shares the love for the Brussels based music of the 80ties and soon started to play. The first album called M.=ADDICTION was released on the label CITY_CENTRE_OFFICES in 2002 . It was highly acclaimed by listeners and journalists . Doerell and Döring were very happy that MALKA SPIGEL ( MINIMAL COMPACT ) gave her voice to the track “Tempelhof”. 2002 Dictaphone made their first 15 concert tour . In 2004 the NACHT EP was released , the basic recordings were done by STEPHAN WÖHRMANN ( drums and Olivers partner in SWOD ), PIOTR RYBKOWSKI (double bass) and Roger Döring (saxophone).They recorded their rehearsals on a cheap taperecorder . Oliver Doerell heard the lofi recordings and loved them and decided to turn them into Dictaphone . 2006 the VERTIGO II album was released . Doerell and Döring took 4 years to finish it . The release concert took place in the amazing Neue National Gallery in Berlin. Döring and Doerell gained a lot of respect for their live performances , excessive melancholic shows . They played at a lot of festivals in more than 20 countries worldwide . In 2009 Dictaphone the violin player ALEX STOLZE joined the band . The third album ” Poems from a Rooftop ” will be released on the Sonic Pieces label spring 2012 .